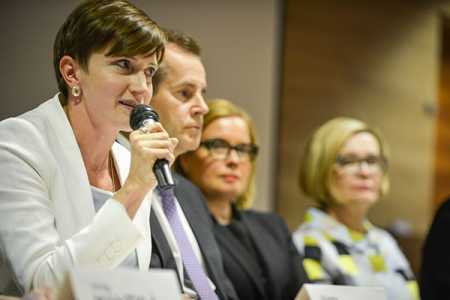 Minister of Health and Social Services Susanna Huovinen spoke at a press conference on Wednesday where other leaders were also present. Photo – Str / Lehtikuva. The social welfare and healthcare reform already agreed by all the political parties in March will be implemented next year through new legislation. 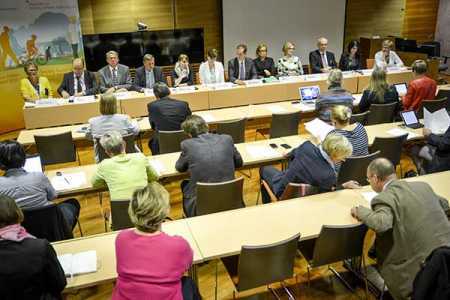 Health and Social Services Minister Susanna Huovinen at a press conference in Helsinki on Wednesday said the steering group has agreed to the solution reached by consensus of all political parties. Ruling Suomen Sosialidemokraattinen Puolue (Social Democrat) lawmaker Jouni Backman said the model is entirely Finnish and has not been adopted from abroad. Opposition Keskusta (Centre Party) legislator Juha Rehula hailed the reform on the basis that it takes into account the differences between regions, such as Lapland, Kainuu and Helsinki. The ruling and opposition parties leaders at the press conference. Photo – Str / Lehtikuva. The ruling and the opposition parties on March 23 agreed on the implementation of a comprehensive reform of social welfare and healthcare services in the country with the view to safeguard the provision of vital welfare services in the forthcoming decades. According to the reform, all social welfare and healthcare services are to be delivered by five strong regional providers. The services by the regional providers are expected to begin on 1 January 2017. The new regions will be based on the current specific catchment areas and rely on existing well-functioning structures. The reform also lays down the criteria when and under what conditions the services can be centralised.